This week researchers in California are scanning a medieval manuscript to help uncover a medical text by the ancient physician Galen, which was scrapped off and replaced in the eleventh-century. The X-ray study is now underway at the SLAC National Accelerator Laboratory, which is operated by Stanford University. The manuscript is a palimpsest, a parchment ­document that was reused centuries ago by scraping off the original text and writing new text on top of it. The original words were penned in the sixth century AD, but then were overwritten in the eleventh century with a religious text offering psalms for the days of the week. Both texts were written in ancient Syriac. The palimpsest first turned up in Germany in the early 1900s, and research indicates it was originally from St. Catherine’s Monastery in Egypt’s Sinai Peninsula. 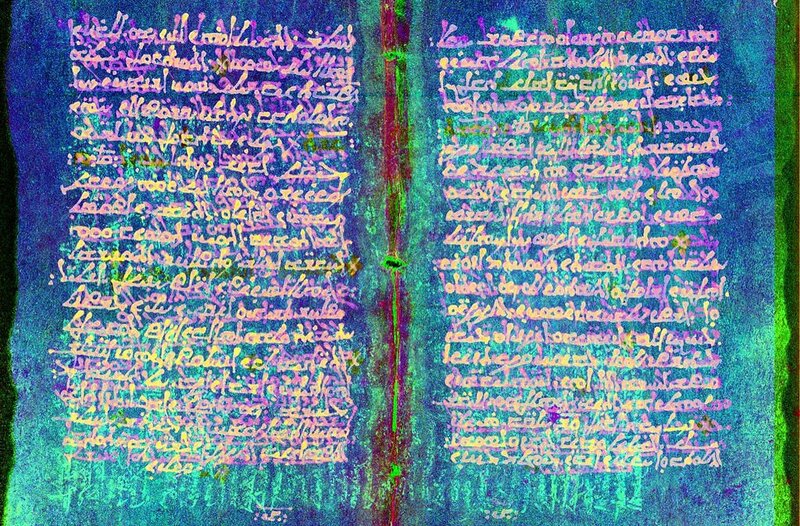 For nearly a decade, a multidisciplinary team of technical experts, scientists and scholars have used advanced multispectral imaging and digital processing techniques to study Galen’s original text. So far they have not been able to reveal all of the hidden text, which was thoroughly scrubbed off in some sections. The work at the SLAC National Accelerator Laboratory involves each page being scanned and converted to high-resolution TIFF and jpeg files that will be posted online for study by scholars. This takes about 10 hours for each of the manuscript’s 26 pages. The images show minute variations in the ink used to write characters and words on the page. The ink in the newer religious text and the residual ink from the scraped off, hidden text respond to the X-ray beam in slightly different ways, and this allows scientists to tell them apart. This type of scanning has been used in recent years to uncover other historical texts, including the Archimedes Palimpsest, where a Byzantine manuscript was found to originally have carried an unknown work of Archimedes of Syracuse.